Hundreds of people have visited a 13m (42ft) high treetop walkway in the first two hours since it opened at Westonbirt Arboretum in Gloucestershire. The 300m (984ft) path is thought to be the longest in the UK and offers a "unique bird's-eye view" of the site's 15,000 trees. The route has no steps, making it accessible for wheelchairs. 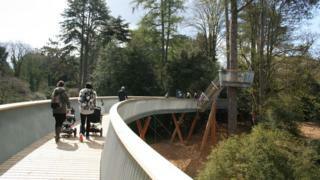 It cost £1.9m, with the funds raised by Friends of Westonbirt Arboretum. Arboretum director Andrew Smith said: "People have been enjoying the views of Westonbirt from the ground for generations, so the time has come to offer our visitors a new and exciting way to see the arboretum by getting up close and personal with the canopy, just like our tree team." The site, near Tetbury, is managed by the Forestry Commission and covers 243 hectares (600 acres). It was established in the 1850s by landowner George Holford.